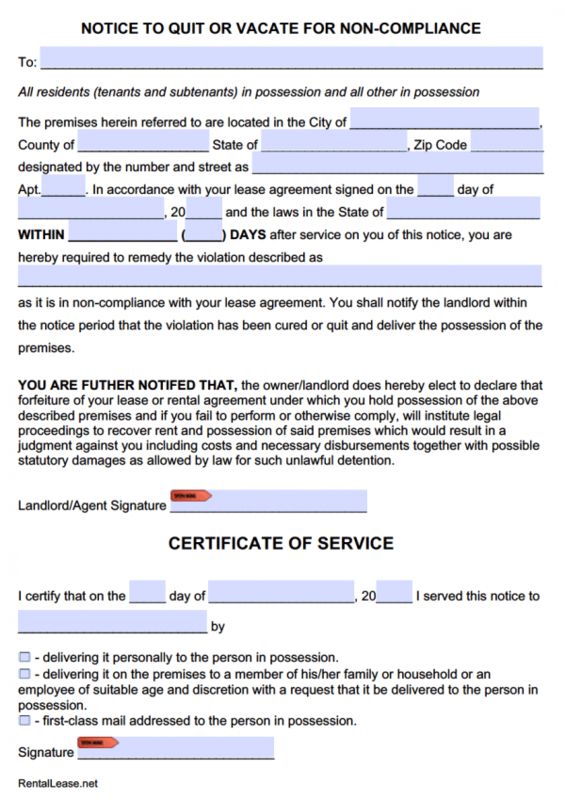 Below a landlord may download eviction notices, also known as “notices to pay or quit”, that are required when submitting to a tenant when rent is late, there is non-compliance according to the lease or notice to vacate. 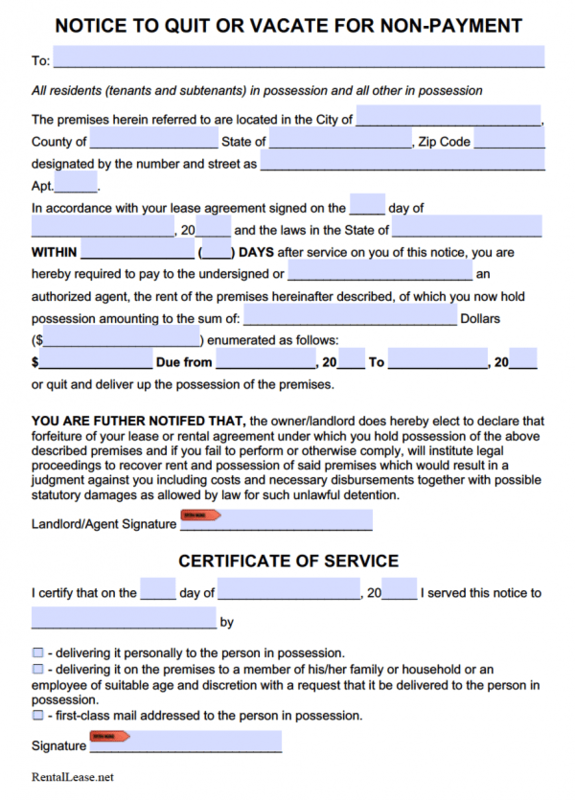 This type of document, typically referred to as a ‘notice to quit’, allows the lessee a time-frame when they may be able to pay all late rent (sometimes including penalties) before a specific date or else they have to move-out. If the tenant remains on the premises past the date specified in the notice and has not paid the landlord, they are committing an ‘unlawful detainer and the landlord may pursue the State process for eviction. Notice Periods – It is imperative that with any eviction notice written that the laws are viewed in your State so that you can accurately input the correct number (#) of days for notice. Notice to Pay or Quit Rent – Sent to the tenant when rent is late. Some States have “grace periods” so it is always best to check to see when this form may be serviced. If the rent is not paid, including all late fees, by the end of the notice period then the tenant will be in illegal possession of the property and will be required to vacate immediately. 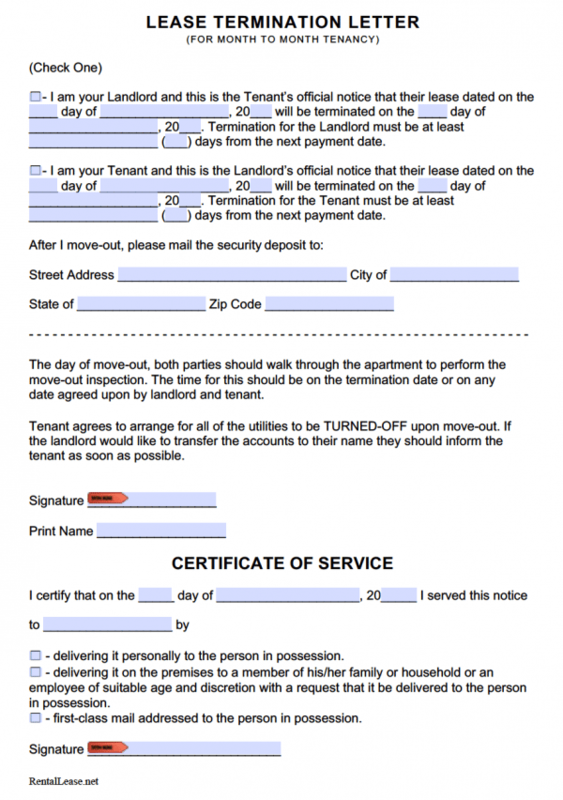 Notice to Comply or Quit – Given when the tenant has made a lease violation other than rent. This is most commonly used as a noise complaint and the landlord can request that if the violation is not cured within the suggested time-frame then the lease will become terminated. Lease Termination Letter (for a Month to Month Lease only) – Use this to terminate a tenancy at will in accordance wit the laws in the respective State. Step 1 – Check the laws in your State to see how much time to give the tenant. Once that is complete you can download the eviction notice in either Adobe PDF or Microsoft Word (.docx) and begin to fill-in. Step 1 – Download in Adobe PDF (.pdf) or Microsoft Word (.docx). Month to Month Termination: 30 days for tenancies under a year, and 60 days if the tenant has been on the property for a year or more. Month to Month Termination: Landlords must give at least 45 days’ notice while tenants must grant at least 28 days. Late Rent: 3 days if tenancy is less 3 months. 10 days if tenancy is 3 months or longer. Non-Compliance: 14 days for the tenant to “cure” the issue and 30 days to vacate if the violation has not been cured. If it is the tenant’s second (2nd) violation in the last 6-months then the landlord has the right to terminate the lease with 14 days notice. Non-Compliance: 30 days (if it is the 2nd occurrence of the same violation within 6-months the landlord has the option to cancel the lease agreement by providing at least 14 days notice). Non-Compliance: 14 days to cure. If not cured, then the lease cancels within 30 days. If the non-compliance occurs at least twice in the previous 6-months then the landlord may also terminate the lease with 14 days’ notice. Non-Compliance: 14 days. If the tenant has committed the same act within the last 6-months then the landlord has the option to void the lease agreement and force the tenant to leave within 10 days. Non-Compliance: 15 days for tenants that have been on the premises for a year of less and 30 days for tenants that have been on the property for more than 1-year. Late Rent & Non-Compliance: 5 days leases of a year or less, 30 days if more than a year. If the tenant has violated the lease (late rent or violation) of the same type in the last 12-months then the landlord can terminate the lease with at least fourteen (14) days’ notice.